WEST ORANGE, NJ - Today the New Jersey Psychological Association’s (NJPA) Executive Board approved an endorsement of the American Psychological Association's/American Psychological Association Practice Organization’s letter of opposition to the American Health Care Act, that was recently approved by the House Energy and Commerce Committee and the House Ways and Means Committee and the Budget Committee. 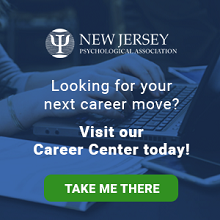 The New Jersey Psychological Association supports the position that any health care reform legislation, considered by Congress, to repeal and replace the Patient Protection and Affordable Care Act (ACA) should increase the number of Americans with coverage for mental and behavioral health and substance use disorder services. Unfortunately, as the recent analysis by the Congressional Budget Office (CBO) concludes, the American Health Care Act would significantly decrease Americans' access to these services, and by 2026 would take coverage away from an estimated 24 million people who would have otherwise been covered under current law, nearly doubling the proportion of Americans without health insurance. Medicaid currently serves 1.7 million low income and disabled persons in New Jersey, including the 566,000 residents who were added through the Medicaid expansion. As a result, the rate of uninsured individuals in New Jersey dropped by 34% within 2 years. The American Health Care Act threatens to take away essential preventative and substance abuse and behavioral healthcare coverage from nearly one-third of those who gained access through the ACA Medicaid expansion. NJPA further feels that the American Health Care Act would severely undermine Medicaid by instituting per capita caps in federal payments to states that would not keep pace with per enrollee spending growth, and by eliminating the Medicaid expansion for Americans with incomes below 138% of the federal poverty level. The letter from the American Psychological Association/American Psychological Association Practice Organization can be read here.